We’ve been taking our kids down rivers since they were in diapers…literally. We’d plunk em next to an adult riding in front of the raft and take them through the rapids. My wife and I are accomplished rowers so our confidence in keeping the kids’ safe is high. We also know that if they fall overboard we’ll be right there with them keeping them safe. Now that they’re getting older they want to get out of the mother raft and start taking their own boats downstream…inflatable kayaks. They’ll be almost completely on their own, their paddling skills and river running sense the only thing keeping them safe. We feel good about them venturing into their own boats though because we’ve done everything we can to prepare them for solo boating. 1. Excellent swimming skills. This seems obvious, but before a kid can be alone in an inflatable kayak they should be good swimmers. This doesn’t mean good swimmers in the pool, but in the river too. The river has currents and waves and rocks, kids should be able to swim strongly through the water and be able to stroke away from obstacles. Of course they’ll have life jackets on, but they still need to be able to maneuver around the river with their swim strokes. 2. Basic river reading skills. Reading the river is the art of understanding what’s happening with the river currents. Understanding river features like waves and holes and eddies is essential to taking the best, safest route through the whitewater. Kids don’t need to be experts, (it’s a lifetime learning process) but they should be able to figure out the safest route through a rapid with a quick glance. If in doubt, they should be mature enough to ask for direction. 3. 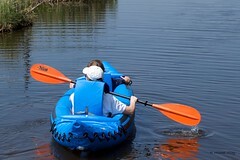 Inflatable kayak handling. Kids usually pick up on this very quickly, but knowing how to paddle an inflatable kayak is important. Understanding how to turn and how to paddle straight using basic paddling strokes usually comes pretty quick to kids. Let them paddle around in flatwater, or through little class 1 or 2 riffles and see how they do. Don’t put them in potentially dangerous situations. Once they’ve been paddling for an hour or so and are getting the hang of things put them through some drills. Tell them to spin the boat in circles. Have them turn 90 degrees and paddle to a designated spot. Send them into small river eddies and let them feel what happens when the inflatable kayak hits the eddy current. Experience matters. 4. Getting back into a flipped over inflatable kayak. Chances are your kids will flip the boat once in awhile. They’ll need to know what to do and how to get back into the kayak without having to swim all the way to shore. The best way to do this is practice. Whenever they’re in a flat stretch of water have them practice over and over until they’re confident. Be sure they understand the importance of hanging onto the paddle if they flip. It’s a lot easier to put everything back together if the paddle isn’t floating off downstream. These 4 points are essential for having a safe and fun day of river running. It sounds like a lot of steps to understand, but the information comes quickly when you spend any amount of time on rivers. If your kids are apprehensive about solo inflatable kayaks, jump into the boat with them to make the transition easier. Once they get the hang of it though, they’ll be kicking you out and they’ll be on their own. It’s always a good idea to keep young inflatable kayakers close to the mother ship. If they get in over their head, you want to be close by to lend a hand.